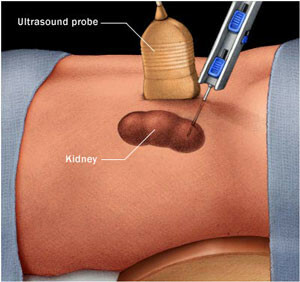 Renal (Kidney) Biopsy is a diagnostic procedure in which a small piece of renal tissue (tissue from the kidneys) is obtained to know the cause of renal failure, to know the cause of proteinuria and to know the severity in some renal diseases like lupus nephritis. An ultrasound-guided renal biopsy can be that of the native kidneys or that of the kidney transplant is routinely performed under local anesthesia in adults but children need general anesthesia. Bedside renal biopsies are performed for sick patients in the ICU and in the ward. The patient needs to get admitted on the morning of the procedure & need to be under complete bed rest for a day after the procedure. He can resume his normal activities a couple of days after the procedure. Some investigations like coagulation parameters need to be checked prior to renal biopsy. Complications like blood in the urine can occur in about 5% of patients. Rarely the bleeding can be severe to warrant another procedure to stop the bleeding. On rare occasions, a repeat renal biopsy may be required if the original biopsy is unsuccessful.